Casting Applications has been traditionally favoured by the Aviation industry. From Civilian Aircraft to Jet Fighters or Helicopters Casting applications are to be found everywhere. Magnesium, Aluminium along with its alloys offers a range of choices. This is due to the fact that they are lightweight and can operate under increasingly demanding conditions. Use of Magnesium in Aircraft Parts Casting In recent years, new Magnesium alloy castings has demonstrated superior corrosion performance. Leading to keen interest in magnesium alloys for aerospace applications. Low density (Just two thirds of aluminium). Excellent high temperature mechanical properties. Good to medium corrosion resistance. RZ5 alloy - for helicopter transmission casings. WE43alloy-for main rotor gearbox castings. Other applications can have auxiliary gearboxes, generator housings, canopies, intermediate compressor casings for turbine engines. Airframe mounted auxiliary drive systems (AMADS) as in fighter jets etc. Use of Aluminium Alloy in Aircraft Parts Casting They have found extensive use in nonstructural airplane hardware. For example parts like pulley, brackets, door handle boxes, clips,quadrants, doublers, ducts, and wave guides. Other application includes use in complex valve bodies of hydraulic control systems. From engines and airframes to skins and fasteners. 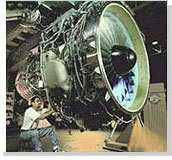 For Jet engines,-compressor blades, turbine disks, and many other forged parts. © 2019 Themetalcasting.com , All Rights Reserved.